Given the amount of diecast thats actually in Tamashii Nations products and the Soul of Chogokin line in particular, do you really expect a Dragonzord /Dragon Ceasar Soul of Chogokin to be under a $100? They'll justify it's price by said diecast, points of articulation and all. But yeah you are right, they should throw in some effects and the proper tail for the Power Staff Combination if anything to help fill out the box with some extra stuff since it is just one mech/zord. But like i said to Hoodimus Zedd, Legacy Dragonzord isn't gonna be compatable combining with Soul of Chogokin Megazord. There is no other way around it. Especially since there is no Zord Builder ports in any BoJ/Tamashii product. And to be honest Tamashii Nations would be stupid not to ride MMPR train just soley because The MMPR figuarts were the only ones to succeed and did very well for them according to Adam Newman. And also because they've been evidently trying to keep that train going again after the failure of the Figuarts Zero Green Ranger. Forgot about the connector pegs on the knees. I definitely don't think they'll offer the theoretical DZ for under $200 to be honest. Hell, I bet there will be plenty of fans that'll buy Dragon Caesar for $300 just knowing it'll combine with SOC Daizyujin. I agree with you 100% that Banda will wanna ride that SOC Dragonzord straight to the million dollar mountain. By the way, what was the difference between the SHF zero green ranger and the regular SHF one? I was just looking at the aftermarket prices for the SHF rangers and its crazy, except the red rangers found a couple for under $60. But they do look a whole lot better than the legacy figure in all sincerity, and have way more articulation. The Zero figures were statues and according to the more critical reviews, fans were upset over their size and the static pose, feeling something that small despite the craftsmanship was not worth the 50-60 bucks it cost. The hyper articulated Green Ranger cost roughly the same and it was loaded with accessories and interchangeable parts. Last edited by Hoodimus Zedd; October 24th, 2016 at 06:09 PM. Is there an Power Ranger Imaginext thread? I used the search and nothing came up. Ultimately while Legacy Dragonzord combining with SoC Megazord is my Dream I'd rather a SoC Mega Dragonzord combine with Legacy Titanus. I'm curious how the SoC Tyranno and the Legacy DragonZord are sized up against each other. Added a few new things to the front. Not much is known at this point about most of them. 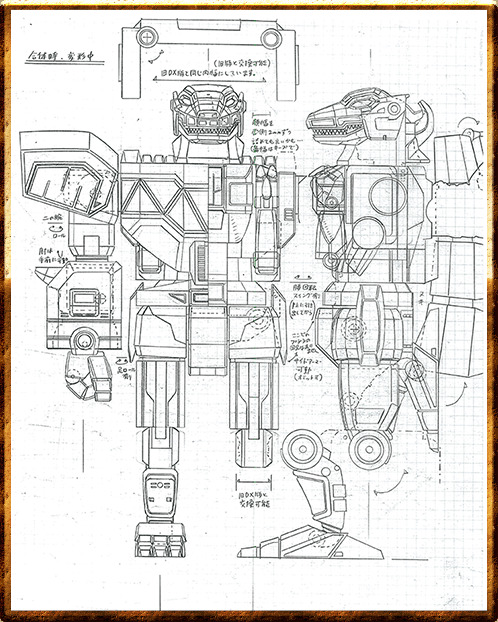 Would you guys buy a $300 SOC DZ just because its, well, a dragonzord? Okay. I really don't know how people are getting the idea of a possible SoC Dragonzord will be $300 as whilst it can be a good standalone release, it is ultimately an add-on to the SoC Megazord. The Legacy Dragonzord does not have too much room for improvement outside of ratchets in much needed areas especially the leg and bottom torso section. The increase in movement range may not be too much when compared to the Legacy Dragonzord and any new accessory pieces may be used to better facilitate the Dragonzord Fighter Mode via a smaller tail section for the staff and maybe a stand or something to help the balance of the Megadragonzord. Heck, the Soul of Chogokin Goldymarg had a heavier accessory count and despite how he can be an okay standalone piece, he is ultimately there for the combination with the Soul of Chogokin Megazord. The Soul of Chogokin Goldymarg I bought for around $150 range and $200 would be the limit for most people especially with the repaints and rereleases for the Legacy Dragonzord mold. I've been wondering about this myself, so I'll share with you my sleuthing process. Before I answer your question vis a vis the legacy Dragonzord, I'm going to start by comparing the 1993 deluxe Tyrannozord vs the SOC rex. Since I don't have the SOC rex yet (duh) I had to set the 93 rex as baseline. First I used a photo posted on these forums comparing the 93 with the SOC tyrannozord and removed the background for clarity. As you can see there is a small problem. First, the legs on the 93 are posed in such a way that it looks to be taller. We will call this posing "Tall Pose." To solve this, I used my own 93 rex, posed it to match the SOC pose more accurately ("Leaning Pose") then took it into Photoshop. I then resized it to match the size of the original 93 photo. You can clearly see the two zords are virtually the same height, though 93 rex is bulkier. That second picture... bloody glorious. That's why I never use flash when taking photos. Man, between this and now probably the 24'' film Megazord... not to mention Ex-Aid Figuarts... I think next year's collecting is already mapped out. That head is GLORIOUS! Simply glorious!